Where you should be eating when you’re in Marylebone. Here at The Infatuation we like to think we do things properly. We pay our own way. We politely decline invitations and openings. We take our mum out and buy her a glass or, more likely, bottle of wine. We eat pretty much everything on offer. We always visit somewhere at least twice: be it a restaurant, pub or cafe. This last point is an important one. We think it’s hard to form a solid and reliable opinion without eating, or even just being somewhere, a couple of times. That’s why our judgements come from consistency rather than one off experiences. 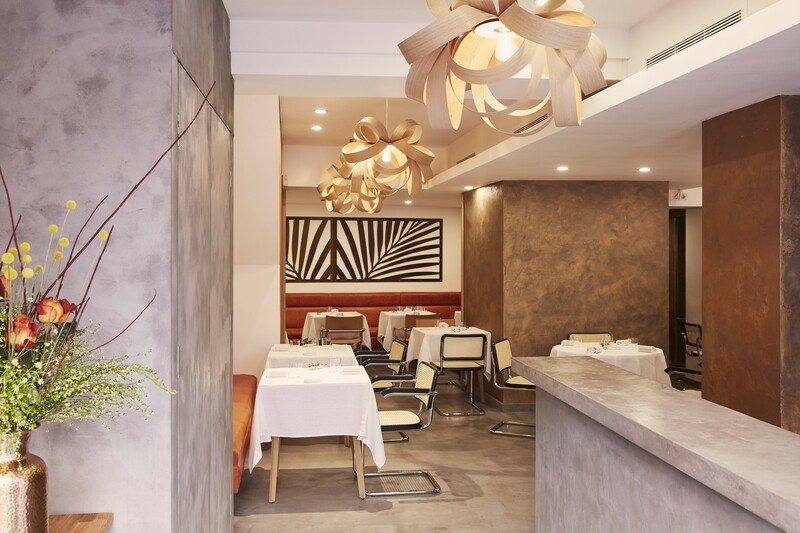 And, that’s why if we’d written a review of Roganic after our first visit it would be leaning towards an excellent 9, but instead we’re giving it a (still) very, very good 8.0. Our first visit to Roganic was to try the ‘business lunch’ menu. As we’re in the business of consuming everything in our wake, this seemed like the most suitable opening gambit. It’s a £40 six course tasting menu that very much satisfied our business needs. We thought “yes this may be fancy Dan fine dining but does it matter when the food is this tasty?“. Obviously, a second visit for the whole shebang called. £115, 16 courses, 10 more opportunities to be blown away. Unfortunately that’s not what happened. Bear with us while we try to explain why. Roganic is a bit like one of those best picture nominated Oscar films. There’s a specific type. They’re referred to as ’seminal’ by your mate who’s into film. So and so’s performance as a 12th century lactose intolerant monk is referred to as ‘breathtaking’. Everyone talks about these films for a bit and then, after a month or so, it’s forgotten about. They’re kind of one-offs. Realistically, they’re made for the best picture category and not much else. Restaurants can be much the same and Roganic is one of those. This is a restaurant named after its director, sorry, head chef, Simon Rogan. Rogan has made his name from foraging. To you and me that’s probably a wander through Epping Forest picking some flowers, but to Rogan and his team that means something else. It’s paragliding towards possible death in the hope of finding a beetroot Rogan’s mother used to sing a lullaby about. It’s waiting inside the hollowed out trunk of a tree for a month to trim the spores of a mushroom for an amuse-bouche that takes precisely a tenth of a second to eat. And what do you do when you go to these lengths? You tell people about it. Roganic escorts you through the menu and tells you who did what and when. That’s okay though, because the staff here are friendly, engaging and not the type to judge your drooping post-beetroot monologue eyes . No, they’re more likely to take the Mick out of themselves and tell you what they like best about plate number 48, which is nice. Frankly, it’s also necessary. There isn’t much else apart from the food to get you going. We’ve genuinely been at wakes with more buzz. But, that’s not what you’d look for here. What you’d look for is the food. Which, at times, is superb. This isn’t poncey for the sake of it fine dining food. It’s ingredients that you’ve definitely eaten before but cooked in such a way that you’ll likely never eat them like this again. Squid and chicken, for example, comes looking like a sort of mutant curled prawn cracker with a bit of chicken inside. It’s a mad and brilliant canapé made up of familiar but completely alien things. It’s these snacks in particular that are extremely delicious. Annoyingly these snacks come first. This is fine if you’re going for the six course business lunch. But if you’re in it for the 16 course long haul, then you may find yourself disappointed as things become increasingly hit and miss with the mains. By the time the desserts enter, things have petered out. Some of the time you’re not entirely sure of what you’re eating because, like a rather long and serious film, you tend to glaze over a little when another character just as important as the last is introduced, even though they don’t look to be particularly interesting. With that in mind, we reckon that less is more at Roganic. And maybe they do too. As well as the six course business lunch menu, there’s also a ten course shorter tasting menu, that only costs £80. These are really useful options to have when you’re looking for a fine dining restaurant that cooks recognisably good food (rather than foams) and don’t want to spend three figures and three hours there. Usually, we’re all for the more is more approach, but here we recommend the edited down version, rather than the director’s cut. A delicious savoury sort of dessert to start your meal. Theoretically gross but in reality good. It tastes like a clam chowder. Chicken trapped in a crispy, prawn-cracker like, squid shell. Not sure what it is, but it tastes good. One of our favourite things. Very rich and very delicious. Scores extra points for obviously foraged twigs (enoki as well). One of many, many main courses. This one is decent enough. Our only memory of this main course was: ‘salty’. The first time we had this it came as duck breast, then a separate duck terrine and then a duck offal salad. It was brilliant. One of many, many desserts. This was our favourite. Strips of burnt milk with a fruity yoghurt. Very nice. Looks pretty, tastes like an apple tart. Oslo Court is a restaurant in a block of flats in St John’s Wood, serving British classics in a room that doesn’t seem to have changed since the 80s. Fischer’s is a Viennese inspired brasserie in Marylebone specialising in Austrian classics like Schnitzel and Käsespätzle.